The Arkansas History Commission will be closed Thursday, November 27 - Saturday, November 29 for the Thanksgiving holiday. David Cunningham was born in 1808 in Virginia. By 1836 he had moved with his wife and three children to Tennessee, where his youngest son Philip was born. Phillip Bible Cunningham, born November 1836, was a veteran of the Civil War, serving in the 32nd Arkansas Infantry. Phillip settled in Clay Township in White County, Arkansas. He married Frances Ella Caldwell in March 1872, and they had four children: William Edward, Althea Evelyn, Frances Ella, and Martha Louisa. Phillip B. Cunningham died in 1901. 1779-1861: Index, Tennessee "Wills and Administration"
1975: "Some Tennessee Heroes of the Revolution"
We're starting a new bimonthly blog post. Written by one of our archivists, Jeff Lewellen, this new blog post will focus on our music collection and Arkansas's music history. We're calling this new section of our blog, Jeff's Corner. 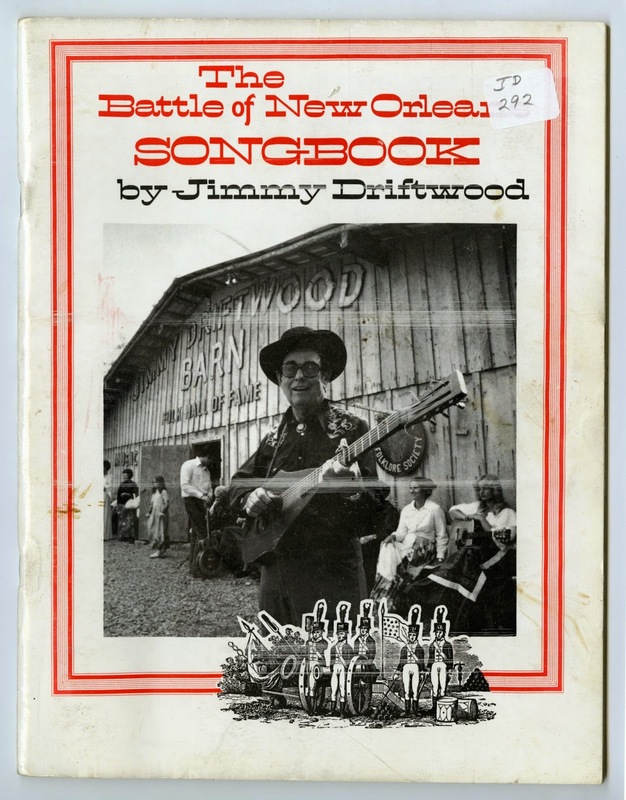 Today, Jeff highlights Jimmy Driftwood's song, "The Battle of New Orleans." Jimmy Driftwood played a significant role in the establishment of the Ozark Folk Center in Mountain View, Arkansas. Driftwood, born James Corbitt Morris in 1907 in Stone County, Arkansas, had enjoyed success as a song-writer and folk singer during the 1950s . His signature song, “Battle of New Orleans” became an international hit for the country singer Johnny Horton in 1959. Driftwood and Horton won the Grammy award for Song of the Year in 1959. Jimmy Driftwood ran the music program at the Ozark Folk Center for the first several years of its existence. He would often serve as the MC of the weekend performances at the large performance auditorium on the Park grounds. On August 27, 1975, Jimmy Driftwood led the performance with his usual blend of stories and songs that made each of his performances unique, informative and unpredictable. On this night, he introduced his most famous song by explaining its origin. Driftwood took the melody from an old fiddle tune titled “8th of January,” which was written originally to commemorate the Battle of New Orleans. Driftwood added his color ful lyrics for this history students as a means to teach them about the War of 1812 and Andrew Jackson’s victory over the British in New Orleans. The rendition Driftwood sings this particular night includes much more of the colorful language and several lines of extra lyrics than the Johnny Horton single. And a-talkin’ with a pirate by the name of Jean Lafite. Region such as Almeda Riddle. But he was also a singer-songwriter, much like Woody Guthie and Leadbelly before him. Driftwood took the elements of traditional folk music which normally have lyrics and melodies that go back so far, no one is certain of their origins, and added his own unique lyrics. The live recordings of performances at the Ozark Folk Center are part of the collection given to the Arkansas History Commission. They can be accessed and listened to onsite by contacting the Archivist On Duty in the Research Room. William Graham Harrison came to Conway County, Arkansas, with his father, Daniel, in 1832, settling near Lewisburg. William Harrison served as a minister of the Southern Methodist Church, ferryman on Cadron Creek and the Arkansas River, and as Conway County Sheriff from 1852 until his death in 1853. He was survived by his wife, Narcissa Wilbanks Harrison, and a son, Robert Weaver Harrison. Green Olive Branch by Sister M. Agnes Voth, Q.S.B. MilLEARNnium 2000, Things We Learned at Yerger Middle School, Hope, Arkansas. Martindale-Hubbell Law Directory, Vol. 1 (Alabama, Alaska, Arizona, Arkansas), 1995. Polk County Pioneers, Vol. XXXX1, Nos. 3 and 4, Fall/Winter 2014. Researchin’ Ouachita-Calhoun Counties, AR, Vol. 34, No. 2, Fall 2014. The Gems of Pike County, Arkansas, Vol. 25, No. 3, Summer 2014. Personnel Missing from Arkansas in the Korean War from Defense Prisoner of War/Missing Personnel Office, typescript and CD. Hope/Hempstead County Chamber of Commerce financial records and correspondence for 1998. 0.8 cu. ft. The Arkansas History Commission will be closed Tuesday, November 11 in observance of Veterans Day. The Rollison family moved from Indiana to Arkansas in 1879. They lived in DeWitt and Almyra, Arkansas County, Arkansas. Thaddeus Warsaw Rollison (1858 November 10-1953 August 29) was the son of Charles Perry (1827-1895) and Matilda Runser Rollison (1823-1898). Thaddeus W. married Rosa Etta Coffey, age seventeen, the daughter of Shelton and Dicy Sanders Coffey, in Arkansas County on October 26, 1879. To this union were born Eva A. (1880), Alma Kate (1882), Nathan Jersey (1884), Cora May (1886), Ina Belle (1888), Charles Shelton (1890), Pearl (1892), Ralph Thaddeus (1894), Nora (1897), Estelle (1899), and Mable (1901). Thaddeus told the story of his family's move to Arkansas from Indiana on a flatboat when he was a teen in the series "From Indiana to Arkansas," Arkansas Democrat Magazine section, July 11, 18, 25, and August 1, 1937. 4. Shelton Coffey, father of Rosa Etta Coffey Rollison. Photo by A.W. Judd, Chattanooga. 1.-2. Almyra School, 1913 February 5. Includes N.J. [Nathan Jersey] Rollison, teacher. 4. Back row: Peyton Moncrief, Glen Alter, [Marion Derrick], Jess Walker, [Mr. Ra]y. 2nd row: Gilbert Bowers, Willie Menard, Ralph Rollison, Roy Bowers, Ray Pearman. 3rd row: May (Fox) Pearman, Tea (Derrick) Fox, Lena (Gibson) Phillips, Sallie Holbert. Front row: Winnie Spratlin, Grace Cullipher, Effie Parker, Grace Cunningham McKay, Hazel (Gibson) Moncrief, Pearl Morrison, Mabel Purdy. 9. Charles Perry Rollison and Matilda Runser Rusher Rollison, T.W. Rollison's father and mother. Photo by Dayton Bowers, DeWitt, Arkansas. 6. M. [Marion], A.S. [Addison S.], Roy and Harley; J.M. Garrison, son of Maletha and Gilbert Maners. Worthington, Indiana, April 22, 1938.